NI's hybrid hardware and software beat machine promises the best of both worlds. Does it deliver? Maschine is a beat-production workstation with built‑in drum sequencing, sampling and loop slicing, and is the latest result of NI's initiative to build hybrid hardware and software instruments. The software element runs as a stand‑alone application or as an AU/VST/RTAS plug‑in, while the hardware is a controller for the Maschine software, and also functions as a general‑purpose MIDI controller. 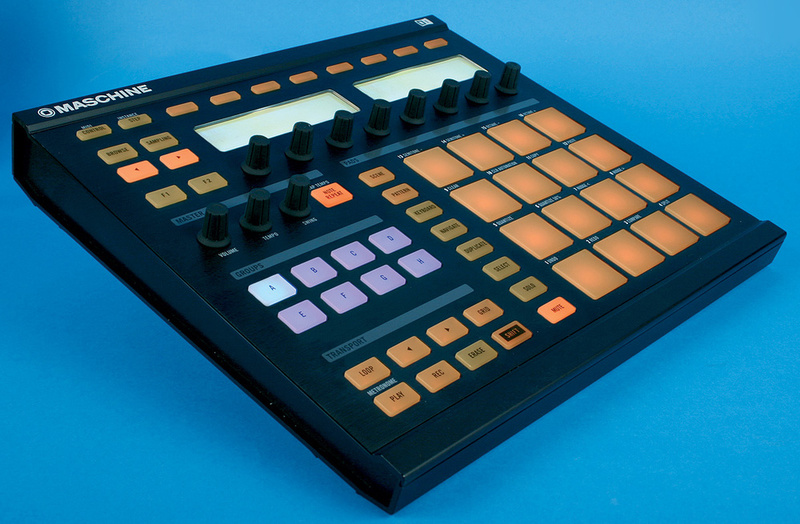 With Maschine, NI wanted to take the tactile, free‑flowing production style of hardware instruments like Akai's MPCs and add the benefits of the computer‑based music studio, and they've largely succeeded. Although the hardware has no sound‑generating capability on its own, the tight integration with the plug‑in gives a similar feel to using a stand‑alone hardware device. The workflow and feature set have also been finely honed, although with some notable exceptions that promise to be addressed later this year. 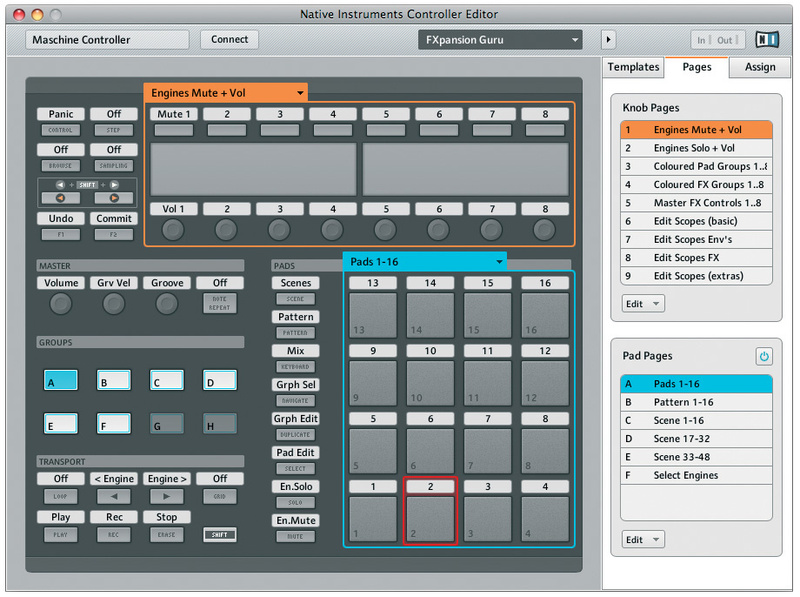 The Maschine software, with Scene manager at the top, device controls in the centre, and pattern/sequence/sample editor at the bottom. Installation is via a single DVD for the software and library, and a USB cable for the controller. You can then launch the stand‑alone app or insert the plug‑in into your DAW of choice. Nearly all operations from this point can be performed from the hardware. The controller is sturdy, constructed mostly from plastic, with a matt‑black metal front panel. The buttons and pads are all made of translucent hard rubber, similar to those on Korg's Pad Kontrol, and can all light up. Above the main pads are twin displays and a strip of eight knobs and buttons which make up the main user interface. The first thing I did was explore some of the NI factory projects to get a feel for what Maschine can do. These examples are complete productions constructed within Maschine. An instance of Maschine offers eight Groups, each of which contains up to 16 sounds, so you can layer numerous parts, including kits, instruments, loops or single samples. In Maschine, each sound element is essentially a sampler, which can contain a single sample or a multisample map. Drum kits each take up a whole Group of 16 sounds, while Instrument patches and loops only use a single sound slot. 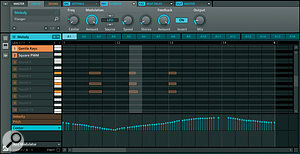 An instrument sequence, with effects automation. The first step in most Maschine projects is to press the Browse button to load a kit, loop or sound from the library. When browsing, the left screen lets you filter the library by category, and choose which level of Maschine's structure to load into (Master, Group or Sound). This system is powered by the Library's Kore‑style tagging system. Maschine lists the potential candidates on its other screen, and provides controls for selecting and loading your chosen kit. All this is mirrored in the software if you have the Browser column displayed. Once a kit is loaded, its 16 samples can be played from the pads. I found the pads a pleasure to play, with a sensitive, consistent response. The velocity sensitivity can be tweaked from the plug‑in's preferences. An MPC‑style Note Repeat button allows you to auto‑trigger sounds at a chosen rate, and this combines brilliantly with the pressure sensitivity of the pads: you can hold down a pad with Note Repeat, then vary the pressure you exert to add dynamics. This is great fun, and if you are recording a pattern, it all gets captured. The library has a category for Patterns, although none are supplied. More seriously, you can't change a kit independently of the current patterns: if you load in a kit, it wipes all the patterns that existed in the Group. The only thing you can do is save out each pattern, change the kit, then load them all back in again. This is a significant oversight: you should be able to audition different kits with your recorded patterns. Measuring 320 x 295mm, the Maschine hardware control surface is about the size of a vinyl record sleeve. To write patterns from the pads, you can either play them live, or use the Step Sequence mode. Holding down the Pattern button shows existing patterns on a grid on the right‑hand screen, where you can select them with the pads. Pattern length can be changed quickly with a knob, and there's also a handy Double button, which doubles the pattern length and duplicates any existing notes. Unfortunately, there's no real support for non-4/4 time signatures at the moment: if you change the meter, the loops in Maschine are no longer whole bar lengths. The workflow for recording patterns is spot-on: while Maschine is looping, simply hit the Record button and play. To rehearse an overdub, disarm the Record button, then punch back in when you're ready. If you make a mistake, Maschine has its own Undo function, or you can hold the Erase button at the same time as other pads, to remove notes in real time. Input Quantise is available, or you can quantise after a record pass with 50 or 100 percent strength. The 50 percent option works cumulatively: multiple presses nudge the notes ever closer to the grid. 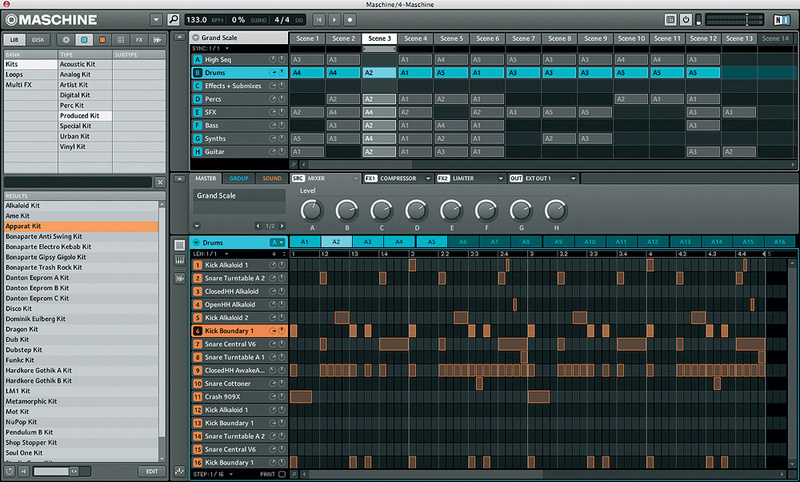 The bottom section of the Maschine software interface shows the current pattern. One slight irritation is that the software display doesn't zoom automatically to reflect the pattern length, so you have to grab the mouse and zoom out for patterns longer than one bar. Patterns can be edited or created directly in the software, using a simple left‑click to add notes, right‑click to delete scheme. If playing pads is not your thing, the controller has a step-sequencing mode, which utilises the pad grid to represent one bar of 16th notes in your loop (you can change this resolution). The right‑hand screen allows you to select which sound's sequence is shown, and navigate through loops longer than 16 steps. Touching a pad adds a trigger at that step. The pads light up in sequence to show the current position, running from bottom to top. 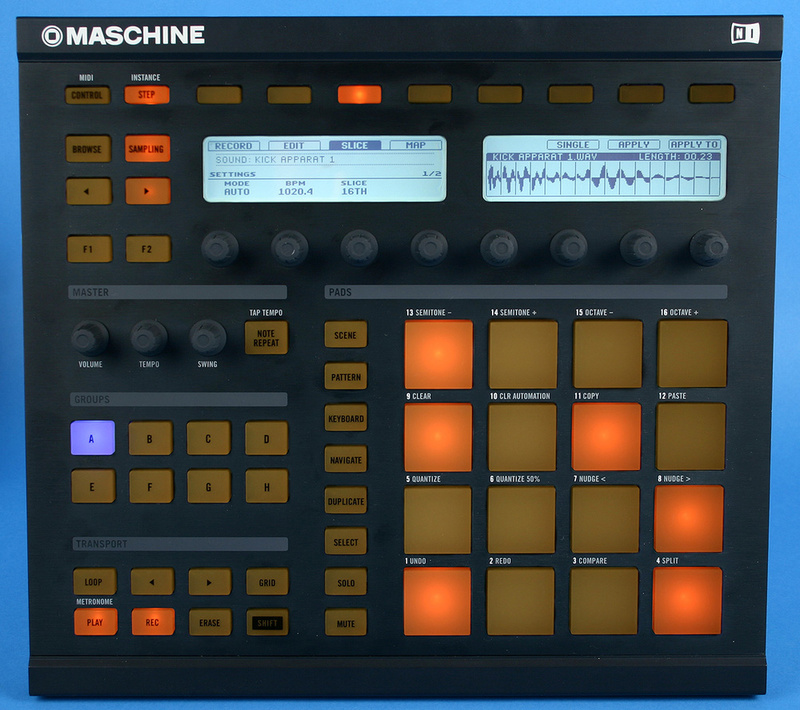 In addition to drum kits, Maschine has a library of sampled instrument patches and loops. The quality is pretty good, certainly better than you'll find on hardware beatbox equivalents, and each sound engine has enough sound-shaping elements, like filters, envelopes, velocity assignments, effects and so on, to bring these basic sampled sources alive. Instrument sounds can be played from the pads if you're out and about with Maschine and a laptop, but in the studio you can use any MIDI keyboard. Whichever sound slot is selected in Maschine responds to incoming MIDI information, and as well as playing instrument patches you can use this feature to play drum sounds in a kit across different pitches. Each Sound in Maschine has its own Piano Roll display where pitched sequences are recorded and edited. With this exception, Maschine is a closed environment as far as MIDI is concerned; all sequencing must be done internally. You can't use Maschine simply as a sound source and sequence its kits and instruments using your DAW. This might seem surprising, but when you stop and think about it, Maschine is designed specifically not to work like this, in contrast to other drum sound plug‑ins available, including NI's own Battery. However, what is an issue is that Maschine can't output MIDI data (other than beat clock) to external devices, so you can't currently use it as a stand-alone production hub like an MPC. NI say this is coming in a future update (seems a good bet, as there's a MIDI out port on the back!). Hopefully, it will also work in the plug‑in version, because it would be really cool to use Maschine's sequencer and workflow to control other software instruments, such as Ableton's Drum Racks. The final tricks up Maschine's sleeve are sampling and beat slicing. The Maschine library has a (disappointing) collection of loops, split into three categories: Guitar, Synth and Percussion. These are all audio samples that have been beat‑sliced, Recycle‑style. Dropping any of these into a sound slot loads the sample map, along with a MIDI pattern that plays back the loop in its original sequence. As with all beat‑slicing systems, this has the dual advantages of locking the loop's tempo to the song, and allowing individual hits to be played back via MIDI in new patterns. Unfortunately Maschine doesn't support REX files, but the word is that this is coming in the future. You can, however, import standard audio loops, or record with the built-in sampling functionality. The sampling is nicely done: simply route some audio to Maschine from external devices or other tracks in your DAW. You can also resample Maschine's own internal sources. The on‑board sample editor module can record on‑the‑fly or sync'ed to tempo. You can also specify a loop length if you want, then hit Start and sit back — no topping and tailing. Sampled or imported audio can be sliced at 16ths or on the transients. 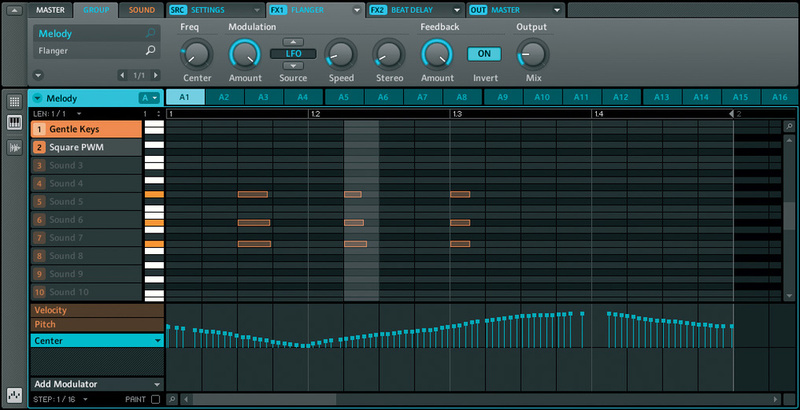 Maschine will automatically generate a note sequence to play back the loop, and drop this into the first pattern slot. Alternately, you can go old‑school and re‑pitch the sample to fit the tempo of your song. There's no time‑stretching option. The Master section, Groups and individual sounds each have two insert effect slots. Groups and Sounds also have two auxiliary outputs. Send effects can be set up internally, by using a spare sound slot as a return channel, or you can route signals out to external buses for processing in your host DAW system. There's a good selection of standard and more unusual effects on offer, with patches also available in the library. One of my favourite features of Maschine is the automation system. All sound parameters, effects and mixer controls can be modulated within patterns, and each pattern can have its own unique automation data. All you have to do is hold down one of the function buttons while Maschine is playing back, and any control movement will be recorded and looped. This automation is relative to the position of the control, so you can still make adjustments later. 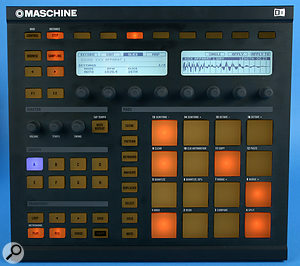 Maschine does an exemplary job of capturing patterns and sequences, and manipulating sounds and effects. So how about creating a performance or arrangement with these building blocks? Pattern changes can be triggered easily from the pads with various quantisation settings. The eight Groups buttons allow you to move quickly between your layered sounds, and you can hold the Mute or Solo buttons while pressing these, to drop out sections of your track. Individual pads can also be muted or solo'ed in the same way. Effects can be loaded from the Browser on‑the‑fly, and automated. As live performance tools go, it couldn't get much more fun or immediate than this. To facilitate both performance and song arrangement, Maschine uses a system of Scenes. A Scene is simply a snapshot of which pattern is playing in each Group at a given time. So, for example, Scene 1 might be an introduction section, with pattern A1 playing in Group 1, pattern A4 playing in Group 2, and so on. You might then set up another Scene appropriate to Verse 1, and so on. Scenes can be recalled in real time in the same way as patterns, giving you control over the high‑level structure of an arrangement. OK, but what if you simply want to capture an improvised performance as an arrangement? (Sound of needle scratching across record). Surprisingly, there's no mechanism for this within Maschine, and very little within a host. Pattern changes cannot be recorded on‑the‑fly, and the Maschine plug‑in has no support for MIDI modulation or automation from a DAW. The only thing Maschine responds to from the outside world is Program Changes, which can be used to trigger Scene changes. Therefore, to create an arrangement, you need to set up Scenes, then place Program Changes in your sequencer at the appropriate transitions in the song. This isn't so horrible in Ableton Live, as you can create Clips which trigger Program Change messages. In other packages it's not brilliant. To record Scene changes in real time you need to download a MIDI control template for Maschine that lets you record Program Changes in your host. This convoluted situation feels more like a workaround than a well thought‑out workflow. As an alternative, you can set up a string of Scenes in Maschine and have them play back in step with your song. However, the real issue is that you've fallen back to editing and thinking about arrangement on a screen. And this still doesn't allow you to capture mutes, solos, and linear control changes, or to drop in a quick fill without triggering an entire Scene change. (Ideally you should be able to trigger and record Pattern changes independently of Scenes, as you can in FXPansion's Guru, for example). Reassuringly, NI are aware that this system is not ideal, and are already looking to improve it. The summer should bring an update to make recording Scene changes easier, and after that, hopefully, more control of other aspects of Maschine may follow. Maschine is the best example of a hybrid software‑and‑controller instrument I've seen. In most cases hardware is developed to control existing software, which usually results in compromise and frustration. Here, the hardware experience has been developed from the ground up, and the result is a convincing illusion that you are using a stand‑alone device. Playing the pads, recording patterns and creating improvised performances is fast and fun, and, most importantly, allows you to stay in musician‑mode rather than technician‑mode. Maschine has a rich feature set: a great library of electronic drum sounds, strong effects, on‑board sampling and slicing, sampled instruments... Unfortunately, it also has weak song-arrangement facilities and host integration. Although configuring and triggering Scenes works to a point, it doesn't support the fast creation of interesting rhythm tracks that a groove box like this should. Hopefully this, along with the other niggles, will be addressed soon, and with any luck NI will have learned from the Kore 2 experience and make sure early investors don't face paying an upgrade fee to get these key features. I'm cautiously enthusiastic about Maschine — it's so close to being brilliant. What it does well, it does really well, and it would be hard to go back to a generic pad controller after working with Maschine. If, like me, you get frustrated programming in a traditional sequencer environment, you should give Maschine a try. I can't wait to see where it goes next. MOTU BPM: Released around the same time, the software-only BPM is a very similar concept to Maschine. The loss of immediacy that comes with dedicated hardware is a big hurdle, but does mean it's half the price. Advantages are REX support, a bigger library (although I prefer Maschine's drum kits), independent pattern and kit loading, basic synthesis, slightly better song arrangement, and better groove features. However, there's no pattern changing from pads without using Scenes, and BPM shares Maschine's main flaw: inability to capture arrangements in real time. I'll be reviewing this in full in a forthcoming issue of SOS. FXPansion Guru: Guru has been around for a while (it was reviewed in SOS September 2005) but has a remarkably similar feature set and structure to Maschine. Guru really gets arrangement and performance capture right, although it relies on the host for this. Like BPM, the lack of dedicated hardware means you need to put in a lot of preparatory work to get a good-hands on experience. Perhaps ironically, Maschine makes a particularly good controller for Guru, and ships with a detailed template. Akai MPC: The MPCs have a strong position in some scenes, but the same guys love their [Pro] 'Tools' as much as their 'empees', so the RTAS version could prove persuasive. The Akais currently have an advantage, being able to sequence external gear as well as internal samples. However, Maschine's flexibility, integration with DAWs and sounds on tap are a strong challenge. Live & Controller: Ableton Live's built‑in Drum Racks hooked up to a decent controller can achieve similar results to Maschine, backed up by strong arrangement tools; but starting from scratch this would be more expensive and, again, is not as instantly gratifying as a dedicated hardware/plug‑in combo. With a quick button press, the Maschine hardware turns into a general-purpose MIDI pad controller, and a seriously good one at that. A deep programming and librarian utility ships in the box. You can switch instantaneously between any of your templates from the front panel. In MIDI mode, the Group buttons allow you to switch the pads between eight different sets of MIDI assignments, and the arrow buttons step through any number of pages for the top strip of eight knobs and buttons. It's good to see that this aspect of Maschine is not just an afterthought. Drum machines often need a bit of help in the 'feel' department, with a little added swing going a long way. Maschine has a global Swing knob, which adds 8th‑note swing to everything. You can also apply individual swing settings to each Group, although this is in addition to the global swing. You have a little more control here, being able to determine the swing resolution, although the only one that usually sounds musically useful is 8ths again. You can also invert the swing. Unfortunately, that's about the extent of it at the moment. There's no groove quantising system, or ability to create user groove templates from loops or patterns. This is a shame, especially as many of the supplied loops have groove in them. The only way to match these is to hard quantise them. As well as many old favourites from Battery, there appears to be a good supply of new drum kits to get your teeth into in Maschine's 5GB library. All flavours of contemporary electronic and urban music are well catered for, and there's even a dozen or so decent acoustic kits with multiple velocity zones. There are enough individual drum samples to keep most of us going indefinitely (900+ kick drums, 700+ snares). The 300 or so instrument patches cover a nice range of acoustic and synthetic sounds, although, quite rightly, electronic, dance and urban sounds are favoured. The loop library is so limited that it almost seems as though it's just examples at this point. I predict that NI plan to go for a few add‑on Euros and push out optional sound packs some time soon. Excellent hardware integration with no setup time. Solid library of electronic drum sounds. Can't write arrangements in real‑time. No host automation or MIDI CC support, so you can't capture performances. It's difficult to change kits and patterns independently. You can't sequence external MIDI gear/software — yet. No REX support — yet. No real support for non‑4/4 time signatures. Maschine shows that fast, hands‑on, musical workflow is not the preserve of stand‑alone hardware boxes. If some of its early issues are addressed, Maschine should become the last word in beat-production workstations. 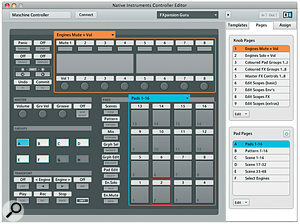 Native Instruments +49 30 61 10 35 1300.